Flop House and Greyhounds of Kyneton were lucky enough to be featured on the Today Show. Thanks to Stevie the host for taking up the offer of a Tokyo Bike to explore Kyneton and give a shout out to the hounds. There are so many awesome little weekend getaways out of melbourne, and the historic town of kyneton in victoria's macedon ranges is just one of them. located 85km north-west of melbourne, kyneton is an easy hour (ish) drive from the centre of melbourne, or an even easier train ride. if you are really organised, take your bikes on the train (catch the bendigo line) from spencer street station - because once in kyneton, you will be able to bike almost everywhere, and its the perfect way to get around. The location Kyneton, just over an hour up the Calder Freeway from Melbourne, has reinvigorated itself as one of Victoria's best country towns for food (five of its restaurants are listed in the 2014 Age Good Food Guide) and for browsing (there are plenty of art, crafts and antique shops). Old buildings dating back to the gold rush and beautiful mid-Victorian countryside are an enticing blend. The place This stylishly whimsical self-contained loft-style building features a main bedroom and lounge, a mezzanine with second bed, and separate kitchen and bathroom. The north-facing deck steps down into the garden, complete with chicken coop. Breakfast is at your leisure and includes an array of fine local produce on arrival, while historic Piper Street is an easy 10-minute walk away. The experience The feel of these lodgings is distinctly Scandinavian and invites quiet introspection. There are beautiful books to pore over, local, artisan-produced furniture to loll in and, everywhere, the space, light and level of comfort you need to unwind, commune with nature and live on a very uncomplicated level. Kyneton is a good base from which to explore the region: just up the road is Bendigo, with the best regional art gallery in Victoria, and in the other direction is Hanging Rock, where you can stage your own disappearance. Don't miss Flop House hostess Genevieve has compiled a cycling guide to the town, including a riverside trundle, and brings bikes up from Melbourne for guests. Be sure to let her know how many you'll need ahead of your stay. Cost: $480 for two weekend nights. Distance: 1 hour's drive (85km) north-west of Melbourne. 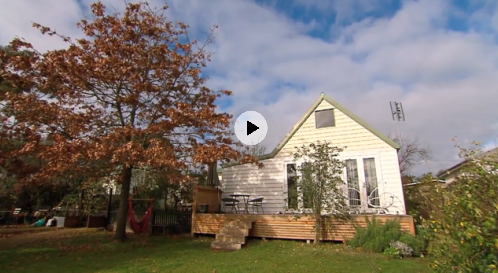 "While there are plenty of reasons to get out of bed in this inspiring town, if you stay at Flop House in the heart of Kyneton, you may find yourself having trouble leaving it. Previously a harpsichord studio, this light lovely light filled loft retreat (complete with vegie garden and backyard chickens) has been lovingly furnished with stylish local artisans' homewards and fair trade textiles. Fresh eggs, locally made jam and other gourmet goodies from the area are thoughtfully provided by the hosts Genevieve and Sonny. " Melbourne’s always been that bit ahead of Sydney. A few years ago people would return from down south with stories of small, intimate bars, lane ways vibrant and full of cafes. Sydney had to play catch up. Now there’s another area where Melbourne has stolen ahead; a changing cultural landscape in country towns. Creative people moving out, starting businesses – bringing a fresh energy to the historic Gold Rush towns of Kyneton, Trentham & Castlemaine. Sunday 6th July, 2014, Postcards showcase on Kyneton, featuring Flop House, Sarah Gabriel of Lauriston Press and Monsieur Pierre. Provides a glimpse into the adventures that can be had over a visit to Flop House and the the good company we keep with other local businesses featured. Whether it’s breakfast in bed, a picnic in the countryside, a crackling fire, or a beautiful glass of wine, Kyneton encourages you to slow down, relax and appreciate the simple pleasures of life. With an easy commute down the Calder Freeway and good train service, the country town at the foot of the Macedon Ranges is becoming a popular destination for weekenders or those opting for a tree change. Sometimes unexpected misadventures bring with them unexpected opportunities & today’s feature story is the tale of one such joyous Pheonix rising! After their neighbour’s renovation went drastically wrong and caused the Council to condemn their own ‘little slice of heaven’ (a home situated in Northcote by the Merri Creek literally a stone’s throw & rocks-crossing from CERES Environment Park & golf course!) Genevieve Wearne and her husband Sonny Kahuroa made a bee-line for Kyneton and they haven’t looked back since! This beautiful guest house in Kyneton, Australia, was once a harpsichord studio. The Flop House as it is called offers rustic chic accommodation, featuring work by local artists & designers and exquisite textiles from around the world. Owner Genevieve Wearne purchased the house in 2008 and gave the old building a Finnish summer house inspired makeover. The pitched roof and exposed wooden beams are what drew Genevieve to the house initially, in spite of the home having effectively been left to perish. The result is a beautiful small retreat, one that I will definitely put on my list of places to stay when I’m in Australia! The photographer of these beautiful images is Tara Pearce and the article was feature in Est Magazine. Resolute in her mission to create a potpourri free zone, Genevieve Wearne set out to restore what was once an old harpsichord studio into a creative space and guesthouse to allow the work weary to reboot, then explore the local art, design and produce of Kyneton. Having purchased the house in December 2010, the studio, or Flop House as it is now known, was cleared of the roosting chickens that had taken over the ‘coup’ and given a Finnish summer house inspired makeover. The pitched roof and exposed wooden beams are what drew Genevieve to the house initially, in spite of the home having effectively been left to perish. Renovation was slow and steady as Genevieve and her partner worked full time jobs during the whole process. A new bathroom and kitchen annex was added, floors and walls stripped back, lashings of white paint was added and the windows opened up and a back deck added extending to the verdant garden beyond. While the studio is completely self-contained with its own private garden, guests can enjoy the company of Wolfie the Irish Wolfhound-Greyhound cross and Ziggy the Italian Greyhound if they whistle. Oh an the resident fancy chickens who have since been relocated to a new, much smaller coup. Guests attending local workshops in the Kyneton area can stay for discounted rates while local products from Piper St Food Co, Inner Biscuit and Banks Fine Wine are prepared to welcome in guests. Local artists such as Peter D. Cole, Lucy James and John Lloyd are represented and displayed through the guesthouse with furniture and homewares by local artisans and designers such as by Rundell & Rundell, , Lightly lights (sold at Stockroom), Spacecraft floor cushions, Aura bed-linen, Vontrott Lamp, Bendigo Pottery, Creswick Woollen Mill blankets have been sourced along with a collection of textiles from Laos and Cambodia. Having left a job that involved consulting to the government on skills for the creative and leisure sectors just over a year ago in a bid to restore and get back to her own creative roots, Genevieve has created Flop House to essentially help others re-connect and regenerate. Just as she has done, both in home and in spirit.